PECO crews work on power lines. 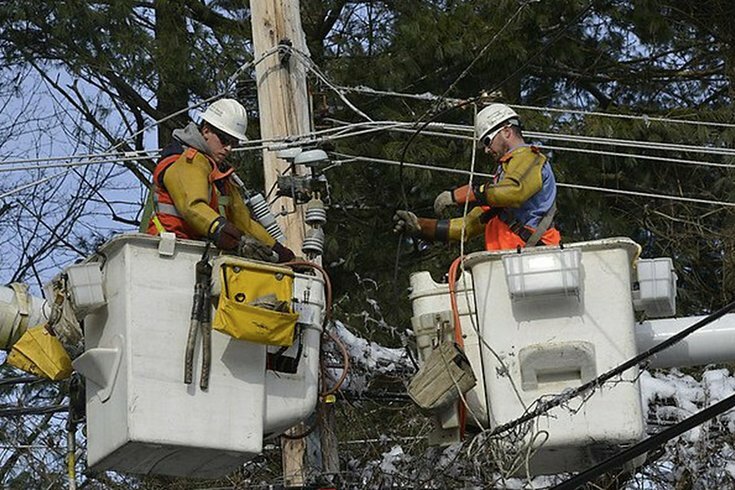 Utility crews working to restore electricity to homes and businesses in Pennsylvania can work longer hours than normally permitted. Gov. Tom Wolf is waiving a rule that limits drivers to 11 hours, the Associated Press reported. The waiver, which is in effect till March 31, allows holders of Commercial Driver's Licenses to work 14 hours a day. According to a tweet from Wolf, 236,000 utility customers remain without power in the state as of 1 p.m. Sunday, down from a high of 587,000 at the peak of Friday’s nor'easter. Workers from out of state are helping to speed restoration of power, the AP reported. PPL, which serves about 1.4 million customers in 29 counties in eastern and central Pennsylvania, said it was recalling about 25 linemen now doing storm restoration work in Puerto Rico to help out.